Stihoima (that in Greek means “bet”, but also “stihos” means “lyrics”) won the bet they had put with themselves and the audience. 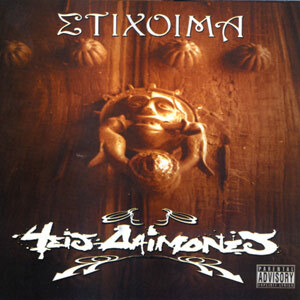 After the release of their first album “Fall of the angels”, Stihoima return with “4 Demons” to disturb the tranquility of Greek Discography. This CD contains 16 tracks, among them the remix of “For a great nation’s leader” that became a big hit. Stoihima continues to claim for freedom of speech with their hot and sarcastic lyrics. Enjoy!